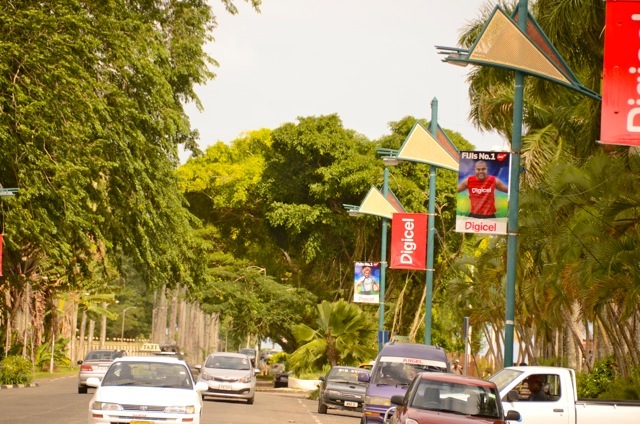 Regular readers of Grubsheet will be aware of our continuing campaign to restore Suva to its former glory, and especially the so-called “Golden Half-Mile”, the area bounded by Government Buildings, the Grand Pacific Hotel, Government House, the Fiji Museum and Thurston Gardens. We derive a huge amount of satisfaction from the power of our pen, or keyboard in this instance, to produce concrete action to improve our capital and again make it a source of pride for all Fijians. Last September, we pleaded with the relevant authorities to address a number of glaring deficiencies: Save the Baka trees on Queen Elizabeth Drive from the imminent threat of felling; get rid of the garish Crest Chicken advertisement on the roof of the Tennis Club that was marring every ceremonial event in Albert Park; fix the stationary clock on the top of Government Buildings and clean the entire complex in time for the opening of the GPH late this year or early 2014. The Baka trees, which were facing the chainsaws because one of them fell down and demolished the Piccadilly taxi stand, are still standing and have been placed in the care of a professional arborist. The Tennis Club has had the Crest Chicken ad plucked from its roof and has been painted a shade of “Fiji blue”. 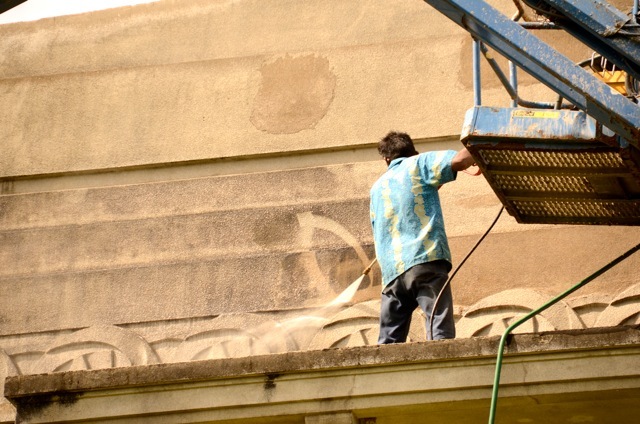 Government Buildings is being cleaned with pressure hoses and is starting to sparkle again through the years of grime. And perhaps most important of all, the clock on top of Government Buildings is working again. Yes, you can look up at it as you pass and it actually tells you the right time. A miracle! It used to be said in Italy that Mussolini – for all his faults – had made the trains run on time. Not an issue in Suva when the nearest train is in the cane belt in the faraway West. But making that clock work again is nonetheless a feat worth celebrating, something of symbolic value way beyond its immediate importance. Because quite simply, it says that Fiji as a whole is working again. We are back in business as a country to be taken seriously. We’re present, correct and on time. No, not Fiji time. The real time as set by Suva’s equivalent of London’s Big Ben. The man behind the project is the country’s erudite and amiable Chief Justice, Anthony Gates, who has been given official responsibility for Government Buildings and its famous clock. 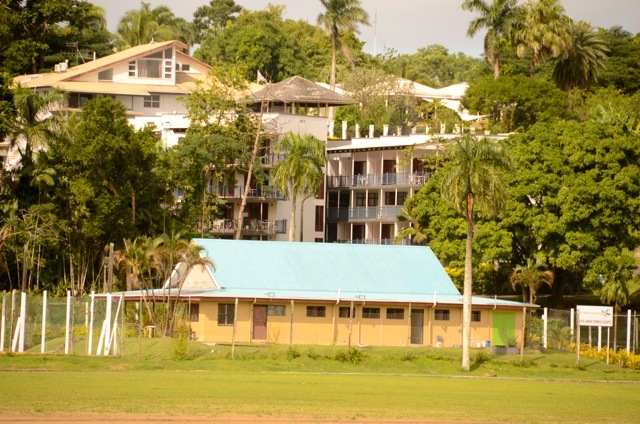 More importantly, he’s also been given some Government money to restore the 1930s rambling pile that was bequeathed to us by our British colonisers and happens to be the finest building of its type in the South Pacific. Justice Gates is using a lot of that money for a program of internal refurbishment to make the business of dispensing justice more efficient. On top of the work already accomplished, two new appeal courts are in the pipeline, a new Law Library, a new holding cellblock for those unfortunates who find themselves before the bench and a crèche to cater for their even more unfortunate progeny. But our most senior Judge is also responsible for the dramatic transformation that is starting to take place outside the building – new window frames and the water pressure cleaning that is starting to show off Government Buildings in all its glory, including some fabulous art deco detailing that’s always been difficult to see behind the grime. The façade of Government Buildings facing Victoria Parade has been largely completed and the difference is dramatic, almost breathtaking, for those of us who love the structure and treasure its place in our history. Grubsheet stood outside there one day in 1964 for the swearing in of one of our last British Governors, the urbane Sir Derek Jakeway. I was eleven years old, a kai colo from the provinces and I had never seen something of such grandeur and splendour – Sir Derek in brilliant colonial white topped by a plumed helmet with ostrich feathers and Anthony Gates’s predecessors in their horse-hair wigs and scarlet robes. One year short of a half century, I now pass by the same spot every day. Government Buildings now literally sparkles in the midday sun and is also rapidly becoming a place worth visiting at night. Because for the first time, floodlights have been installed to highlight the building during the evening hours and show off the new restoration work. 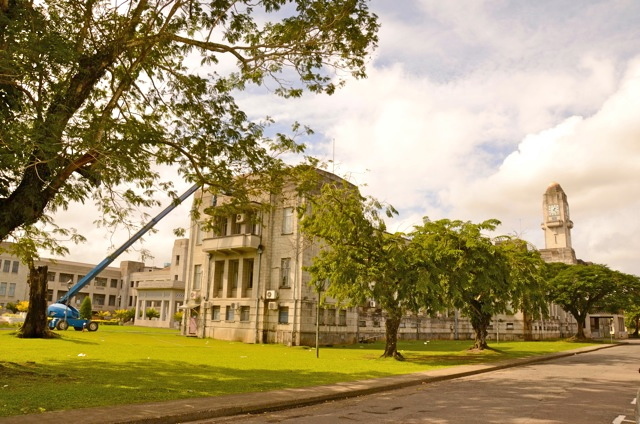 The Chief Justice’s next project is not merely to get the famous Clock going again but also restore its chimes – that used to ring out every quarter hour over Suva and mark the rhythm of its day. In the old days, there was never any excuse not to know the time even when you didn’t have a watch. My parents –who later lived in Pender Street – would tell me to be home just after midnight when I’d go out roaming with my friends on a Saturday night. How did I know? When the clock struck twelve, of course. It wasn’t a deep bong like Big Ben but a more hollow, feminine chime that I can still hear in my mind’s ear to this day. 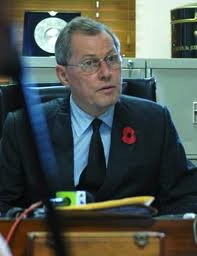 Justice Gates came to Fiji in 1977 and he too, still remembers how the clock sounded. Yet a whole generation of Suva residents have never heard its trill and it’s really quite thrilling to think that very soon, they will. At the swearing in ceremony at the High Court yesterday for a gaggle of new Commissioners of Oaths and Justices of the Peace, the Chief Justice had Grubsheet spellbound as he told the story of our beloved clock to the assembled dignitaries. It was built and assembled in Northern England in 1939 – the year World War Two broke out – by the Cumbria Clock Company. 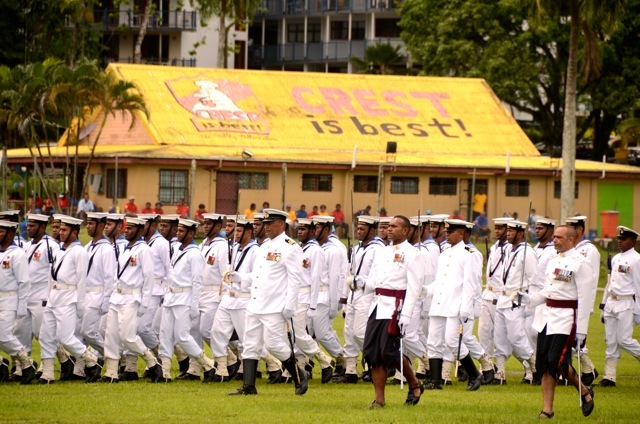 No-one seems to know how it came to be commissioned or how it got to Fiji. But as fortune would have it, the company is still in business 74 years later. Can you believe it? You better. Because Justice Gates has got the excited folk at the Cumbria Clock Company to assist with the restoration of their brilliant creation, high atop a tower at the far ends of the earth in what used to be the British Crown Colony of Fiji. As the CJ tells it, the company still has its small factory in a rural setting near Lake Ullswater in the Lake District. In one of life’s strange coincidences, the factory is no more than 20 kilometres from where Justice Gates’s father’s family originated and lived. 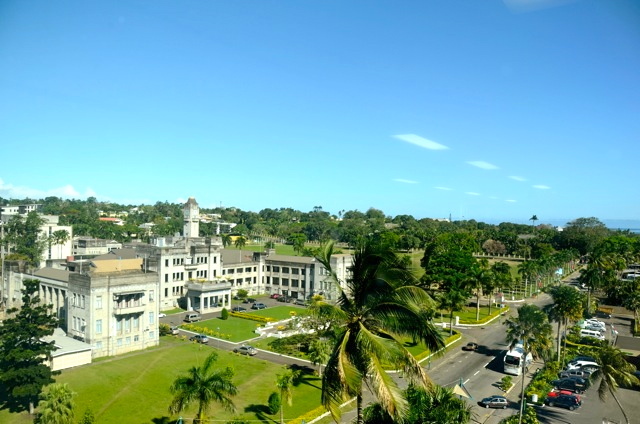 So the clock came from Gates country three quarters of a century ago and now the young Gates – His Lordship, the Chief Justice of Fiji – has the happy task of presiding over its restoration and getting it going again. What a thrill that must be. 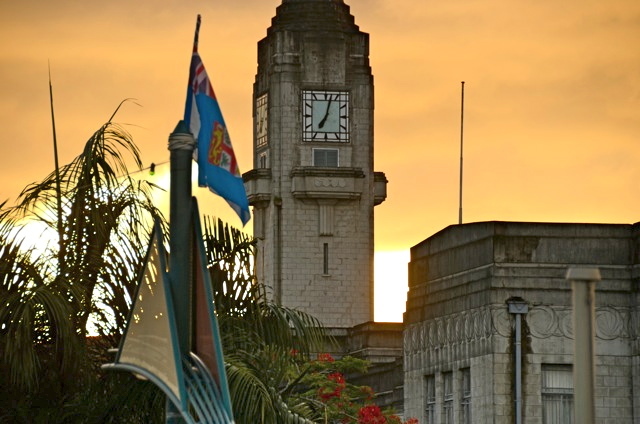 As the CJ puts it: “Once again the inhabitants of Suva, the capital, will be able to set their clocks and order their days in obedience to its chimes”. And Grubsheet, for one, can’t wait. Why all the fuss over a clock that few people remember working and even fewer remember hearing? Because when those chimes start ringing out again, all the decay, all the lost years in Fiji, will finally be rung out too. It’ll be the new Fiji, the better Fiji, that we are all being promised. The one that works again. The one moving forward across the face of time. Call me a sentimental romantic, a relic of Viti Makawa, but this I believe: The restored clock atop a restored tower overlooking Albert Park – spotlighted at night -will again be the marker of the nation’s progress, a beacon shining out across our “Golden Half Mile”, a symbol of our glorious past and the promising future that finally beckons. Oh. And there’ll be no excuse for any Suva teenager within hearing distance to ever say again – “Sorry I’m late home, Dad, I didn’t know what time it was”. This nation will be restored to its former glory. We have endured a lot because of the greed of some elite groups. Now this country moves forward. All this while the sanctions are in place. It is truly incredible to see the pace of improvements. Even the police forces are looking good. The useless thugs no longer terrorize the helpless. Why? Because someone stood up and decided to fix the issues. There are still many challenges to work on but things are moving ahead. For those that protest, getup and help with the work or just go to the democratic heavens that you crave for. This nation needs workers not whingers because we don’t have the resources to satisfy their elitist demands. God bless this nation .. I am working towards securing the future and I hope the others do too! In an era when mobile phones/ditigal watches have alarms,do we need chimes/clocks to remind us of the time? Symbolism is the practice of investing things with symbolic meaning, even when we instinctively know that there is no one thing that stays the same during this life. 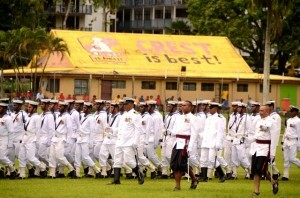 We can all now look and hear a powerful symbolic account of time above our government as we advance in our unique Fijian way of life. In the era of fast food, television and the internet, do we need any of our traditions, the vakaviti way or religion? The clock at Gov Buildings is a symbol of a Fijian tradition. History is to be valued, not dismissed in our digital age. During the late 60’s and early 70’s had the pleasure to work with you at FBC as I was a technician in the engineering department . Larry Kant reminded me recently about your articles on the progress in Fiji and I’ll be connecting regularly…..”GOD-BLESS” you my dear friend and keep up the good work! Graham I congratulate you to your war on negativity. Your reporting of important developments such as the cleaning up of our city lifts the spirit. While other blogs only report on government corruption, torture, human rights abuses and the bad state of Fiji’s economy, your wonderful articles focus our minds on what really matters. Nice to hear and see the changes. Thank you to all who have worked so hard in bringing back those lost glory. Esp. to the CJ and team. Also thank you to the SCC and all the people of Suva. 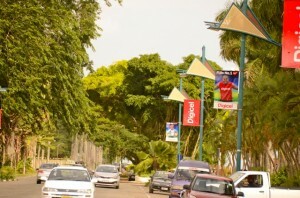 Looking forward to see more good changes for the betterment of our Capital and our people. Thurston Garden and our Museum are perhaps areas I think we also need to work more on. It has alot of potential! A lot of tourists frequent this place and I believe Suva can offer more in making trips there a memorable one. Last year I saw hundreds of school children from various schools also visiting these areas. I’m not sure whether there were any guided tours for the gardens. There’s so much we can do to install or erect in this garden to make their field trips also more exciting and worth the while ……….. while earning revenue for the administrators. We need to be more creative to capture our children’s imaginations and help them understand and appreciate our history, our artifacts, our traditional woodcraft, our plants and flowers, etc. For our children’s, tourists’ and people’s benefit perhaps we can also add in there small Waterfalls (powered by solar), Koi fish ponds and beautiful landscapes and sight-seeing and picnic areas. Pictures available on the internet on these are just so amazing and really attractive. Maybe we can even set up some shops for handicrafts, etc to be sold in there. This way administrators can earn money, create employment for our people and promote Fijian made Fijian Crafted products. I believe our Universities would also like to partner projects in this area like research on certain flowering plants and other exotic plants, etc. Maybe our Military and Police and Fire Depts would also like to partner the administrators for areas showcasing their history, old historical assets like cannons, old fire trucks, uniforms, etc. Private firms may like to sponsor some projects within these gardens/museum. Like solar companies, landscaping companies, refrigerating companies, electrical companies, etc. will be interested in the waterfalls and temperature controlled environment projects. Oh my ………… there’s so much! Really hope we would get there one day …………….. perhaps very soon. May God continue to bless our Capital and our nation – and may we prosper. Am impressed with all major developments thats going on, but yet its being done by a temporary government with whom many people not only supported but also even wanted to stay in power and not go to the polls. But hey, of cause government itself is not perfect but at least its doing something other past goverments neglected to do. Definitely worth seeing the changes happening around the capital. This entire election business is a waste of time and money. Why can our PM and his extremely efficient AG not stay in government? Why do we have to put up again with the old politicians who did nothing but to enrich themselves? We all know how much support our leaders enjoy amongst a vast majority of the population. Why can’t the military say, well this is the government of the people for the people and by the people as the military in Egypt has just done. The USA did not even consider it a coup. Good one Peter! food for thought- as if the democracy we now have is A OK no ! System?? We need to just open our eyes to see how those in power and their mates milk the system. China ain’t doing to bad last time i look it wasn’t a democracy. This is the first government since Fiji’s independence that truly has the welfare of the entire population as the main objective. All these rumours about the millions of salaries that our PM and AG pay themselves are just that rumours. It will be a big surprise for all the contrarians when they declare their assets and incomes: Both men have taken the workload of multiple ministerial portfolios but only claim modest salaries of 80.000 FJD per year. I know it is more that the average clerk earns, but please do not forget that these man have taken on the work load of an entire government. Perhaps Graham should do an article on the busy schedule our PM has to cope with. His relentless travel for the benefits of the nation would break any ordinary man! You make a good point about the effort these two guys have been and continue relentlessly to put in on behalf of the government. Too many seem to think it’s a life of luxury continually travelling and attending this and that meeting or function. It’s done at a cost to your personal life. The fact that they are always at this or that function suggests that someone is inviting them and you do not normally invite someone you dislike or do not have any respect for. Suggests popularity to me. As for all the hype, questions and rumour about pay what difference to the way people view them would it make if they earned $40,000 or $4,000,000 a year ? Would they suddenly become loved by the haters because they only earn an average wage ? In fact, if the two leaders, our AG and our PM earned 4 million a year, it would be money well spend. We got more reforms and improvements of our daily lives than from all post independence governments together. We have now excellent infrastructure built by our Chinese friends, foreign investment is pouring in, jobs are being created at a truly breath taking rate, the sugar industry is in top form investing in new projects such as ethanol and passenger trains and the forthcoming constitution will eliminate race and corruption from our land. I guess what we we get is very good value for our money. Agree with you Peter. Fiji needs dictatorship. Lets keep the 2 in power and stop money wasting with election. Who cares about NZ and Australia. What have they done for us anyway. Peter…..where is your evidence? The people of Fiji believe that Frank & Khaiyum are ‘milkng the system’. You dont’ live in Fiji so don’t how strong the views are on the streets!.., I am now beginning to see the light…!! Good job by all in Fiji. After reading Fay Volatabu’s experience travelling Fiji Airways from Vanatu….I am now very worried that all this propaganda about Fiji Airways…or .Air Pacific aka “Air Pathetic” …..is a con job…..no wonder Dave Pflieger flew thew coup so very soon…I have just rebooked my flight to Nadi from the new “Fiji Airways” back to Virgin. I dont wanna be messed around by Fiji Airways…they are not as efficeint as their “propaganda” makes them out to be. Kathy, how precisely do you rebook from Fiji Airways to Virgin in this age of online bookings? You need to pay for the ticket to secure the booking. Are you suggesting that you paid for Fiji Airways and having then decided to go Virgin instead, they got their money anyway? All I can say is that if this is what the airline’s critics are doing, the survival of Fiji Airways is guaranteed. And funny how these horror stories are legion. After three flights on the new Fiji Airways, I think the new planes are brilliant and the staff couldn’t be happier, more helpful and more proud. I’ve had plenty of Virgins in my time and all that faux, cheery camaraderie you can keep. It seems to me that many Government critics can’t stand the fact that Air Pacific pulled out of the crash they would have preferred. All part of the nihilism of the opposition. But if you’re happy on Virgin, by all means stay there. Older planes, bogan air crews, hand in your pocket for anything to eat. Happy flying! Last week we flew air pathetic to Fiji from Sydney. Flight was delayed, seats recliner didn’t work, food was crap as we ordered special meal, tv broke down mid flight. We paid full fare as this was peak holiday travel. How about spending $5k Hong Kong – Nadi and get a slice of pizza for breakfast with a use by date sticker attached – use by, over and out. It is just disgraceful how you guys undermine the pride of our nations. Clearly, Fiji Airways is the best airline in the region. Sure, flights are delayed, the planes are often half empty and the employees have sometimes strong views on the essential industries decree. But compare this to Air NZ, Quantas, Jetstar etc. They may be more timely and have less breakdowns, their tickets may even be cheaper but Fiji Airways is our airline. So be patriots and use Fiji Airways. I’d never fly anything else! I read your article with interest in the paper recently. While it is wonderful news that there are moves to restore the Government Buildings, the old Grand Pacific Hotel and the strip along the sea wall, I wonder if any of the supporters of this project have recently taken a walk along the sea wall? I do not have a car here in Fiji, so I walk or ride the bus. From that vantage point, on any and every day of the week, you can see recyclables, and rubbish by the tonne along the walkway and small beaches that dot the sea wall. Notably, it seems that the majority of garbage dumped on the nature strips and beaches seems to be outside where the Government employees take their lunch. If you look at the beach outside FIRCA, the beach outside the Suva City Council Buildings, and the beach outside the Government Office Tower, you will see the remnants of daily lunches. It is a strange twist of fate that many of the polystyrene “lunch packs” that are used at almost every take away shop say “Bula” or “Fiji”. This is quite embarrassing really. There are also no recycling bins at all that I have seen either along the sea wall, or in Suva City, or anywhere else. Recycling bins must be a priority for those in authority, as there are approximately 44 million PET plastic drink bottles in Fiji every year (that figure though was from 2003). What use the mantra of Reduce, Reuse, Recycle if there are no public place recycling bins. Coca Cola Amatil and Fiji Water have a joint program where they will collect the bottles and pay per kilogram, plus all aluminum cans. Surely Suva City Council could arrange this, and if they need assistance, I am happy to facilitate. Could part of the cause of the problem be that much of the recyclables and garbage is not visible if traveling by car, and that many in authority have a driver and a vehicle? Part of the solution could be a “plain clothes Friday” for all government and council administrative staff – a lunch time barbeque could be provided on the beach, and a weekly show of civic duty to pick up one’s own lunch rubbish could be exhibited. Recently we did a clean up on a 5km stretch of a rural dirt road in Koronivia, and collected more than 1,200 bags of rubbish and recycling. Cleaning up sporadically is not a solution, and too often every article in the paper about clean ups mentions this or that community group, but does not mention or tally WHAT was collected. Once we learn that the rubbish needs to be tallied,and the results published, then maybe we will get some action. Fiji is abundant in beauty and resources, and could be a leader in the Pacific if we learn how to deal with recycling, and fast! Recycling bins can even be made from the plastic bottles, so very little expenditure is needed. I am being contacted by communities across Fiji who want to recycle, and just need someone to help them to get it organized. If you or your readers wish to be involved, please feel free to contact me. Understandable that not everybody supports the interim govt despite those “good deeds” that they’re doing within the country and abroad but yet there some very interesting discussions about govt.